Clogged or backed up drains are no match for AAA Sewer & Drain Cleaning! We’re your local area drain cleaning experts, serving both residential and commercial customers. Our services include drain cleaning, camera inspections, hydro-jetting, unclogging services, line inspections, locating lines, pump repair and more. Our company has been in business since 1984 and is backed by decades of experience! We’re equipped to perform drain snaking and use a camera to discover additional issues. We offer free estimates on all our services to prospective customers. When your drains are clogged or backing up, don’t waste your time trying to unclog them yourself. In fact, you don’t even need to call a plumber in Benton County, MN! All you need to do is pick up the phone and put a call in to AAA Sewer & Drain Cleaning. We specialize in drain unclogging and cleaning, and will have your drains flowing again in no time at all. Whether the blockage is caused by calcification, tree roots or something foreign lodged in your plumbing, know that we’re equipped to remove it entirely. We don’t leave until your drains are flowing smoothly once again! 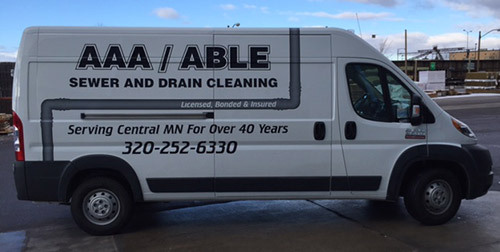 What makes us the go-to source for drain cleaning in Benton County, MN is a combination of experience and technology. Our professionals are backed by decades of insight and experienced—we know where to start looking for drain problems and can adeptly identify the best course of action for dealing with them. Moreover, we’re equipped with tools like camera snakes and line jetting equipment to help us identify and obliterate clogs deep within your drains. It all culminates in our ability to deliver service you can count on to restore the form and function of your drains. The next time you’ve got a clogged or malfunctioning drain, give us a call and see for yourself why we’re the best in the business! Don’t let clogs or blockages cause you plumbing headaches—instead, let us take a look and clear your drains! We’re experienced in providing a wide range of unclogging services.